How did an aircraft company become a major amusement ride manufacturer when most of their rides didn’t even look like airplanes? It all started with an aspiring pilot and lifelong tinkerer. Born in Illinois in 1892, Lee Eyerly had a natural curiosity for machines. When he was a teenager, he and his family moved to Hobson, Montana where he found work repairing farm equipment. In 1911, he traveled to the famous Dominguez Field in California where he was introduced to many well-known aviators of the day. Since the famous first flight of the Wright Brothers in 1903, the possibilities of air travel captivated many Americans, including Eyerly. He dreamed of building and flying his own planes, but didn’t have the money to execute his plans. When he returned to Montana, he started up his own auto shop while tinkering with gliders on the side. He soon married and started a family. A drought in the region at the time was drying up farms as well as work for a farm equipment mechanic, so Eyerly moved his family to Salem, Oregon in 1919. He started up his own business greasing and lubing automobiles while also working as a mechanic at the local Ford garage. His love for airplanes and flying led him to take flying lessons from a local barnstormer in a Curtiss Jenny airplane. After just three hours he flew the plane solo. This was all the formal training he would ever have. He moved to nearby Waldport, Oregon for a few years. Upon moving back to Salem in 1927, he bought a little mail plane and began a flying school and airplane repair shop called the Pacific Airplane Service. At the time, his was the only airplane service station on the West Coast. Within about a year, Eyerly developed a new monoplane design that was the first modern airplane design created in Oregon. He continued modifying and developing the concept, but with the onset of the Great Depression, only two were built. However, it was the Depression that also brought about Eyerly’s biggest success. In 1931, he put together a mechanical device for training pilots which recreated nearly every possible movement experienced while flying a real airplane. This forerunner of modern flight simulators was named the Orientator. Unfortunately, only five were ordered – all by the Cuban government. Art McKenzie, a fellow member of the Oregon State Board of Aeronautics, saw the potential in the device as a means of entertainment. Recreation and diversion became more desirable to Americans that had grown weary from the hard times created by the Depression. Before he could fully convince Eyerly, McKenzie had already collected a long list of orders for the Orientator as an amusement ride. Eyerly set up a production line to crank out 50 rides – which had then been renamed the Acroplane. After Eyerly saw how popular the Acroplane was at carnivals and fairs, he developed the Loop-O-Plane, Roll-O-Plane and a multitude of other rides with great success. Despite the shift in products and clientele, ‘Aircraft’ remained in the company’s name. When Disneyland was being planned, Eyerly Aircraft was approached to build a Dumbo ride based on Eyerly’s Octopus, but in the end the job was given to Arrow Development in California, which had not yet reached the level of financial stability that Eyerly Aircraft had achieved at that time. 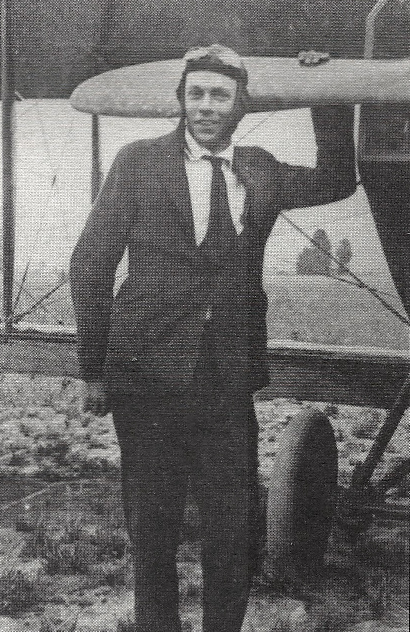 While he may not have had success from building airplanes, aviation was still a big part of Eyerly’s life. He was instrumental in establishing and managing Salem’s airport, located right next to the Eyerly Aircraft facilities. The ranch he lived on outside of town also had an airstrip so he could easily commute to and from the office via his own private planes. Around the early 1950s, he retired and left his sons Jack and Harry in charge of the company. Lee Eyerly died of cancer at age 71 in 1963. In 2001, he was inducted into the Oregon Aviation Hall of Fame. Lagoon has had a good amount of Eyerly rides over the years, starting with their first Roll-O-Plane in 1947. When a tragic fire destroyed half the park in 1953, new rides were needed. Three new Eyerly rides were part of the 1954 lineup – the Octopus, Rock-O-Plane and a new Roll-O-Plane. A Loop-O-Plane and a Super Roll-O-Plane were added in 1972. Bulgy The Whale, which is still part of Kiddie Land after more than 60 years, is also an Eyerly ride. Incidentally, the Paratrooper was created by Frank Hrubetz who was Eyerly’s chief engineer for many years in the 1930s. 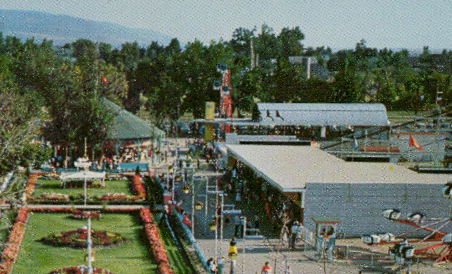 This 1954 postcard shows an Eyerly Octopus in the bottom right corner and the Rock-O-Plane on the other side of the Roller Coaster station in the background. Abbott, Sam. Eyerly Keeps Eyes in Air For Well-Grounded Ideas. The Billboard, 30 Jun 1951. Villani, William. Eyerly Flies into Hall of Fame [PDF]. Oregon Aviation Historical Society Newsletter, Nov 2001. Lee Eyerly. Salem History Online, accessed 4 Feb 2017. Lee Eyerly. StateMaster.com, accessed 4 Feb 2017.